Space Invaders was a vertical monitor.. but the awesome projection on the background made it look like a wide playfield Taito Space invaders cabinets were so prevalent back then where I come from, that they were the first machines (at least in the very beginning) Ops used to hack out another game in them.. e.g. "Alpine Ski" in a SI cab is another vivid memory. I know what you mean about the mirror... As to how they got rid of it (or did they use it) I don't remember. this was over 30 years ago when I was only 12 or so, but they did it allright. A lot of times the bezels painted black as well which was another sad thing. I honestly don't ever recall seeing a converted black and white game. I "think" the first conversion I encountered was a Williams' cab - thinking it was Defender. B/W games are more sought after, and that means collectors will spend more effort restoring them. There is nothing "special" in a mame'd cabinet. A full-size mame cab is essentially a wannabe. A bartop is an entirely different story. Edited by Keatah, Tue Oct 25, 2016 7:40 PM. Where are you supposed to find a good board of the same game in working order, short of gutting another, already working cabinet? Nobody is manufacturing these boards new anymore, right? So the only way to fix one would be to gut a working one. That seems like a chicken vs. egg secnario. You buy a loose board on a place like eBay, or find a collector (plenty of arcade forums around) for a spare. Or in your specific example, if the existing board has problems, find someone to fix it. There are few instances where a board is non-repairable. One last question - is it acceptable to gut a working Golden Tee cab, since there's a brazillion of them out there, and it's an awful game anyway? The problem with Golden Tee cabs is that they have a trackball control panel. If you want to convert it into something else that doesn't use a trackball, it will be a little more work as you'll have to hack up the existing control panel. But yeah, do whatever you want with it. I don't think anyone's going to care since they keep pumping out new revisions every year. Sought after now... but back then (around that Jamma era) not so sure. Unfortunately, I believe many black and white games were dumped by OP's once they outlived their usefulness. I recall many auctions way back when, where at least you would see a couple of B&W games on the list and you could get them cheap. Nowadays, you would be lucky to find one. Over the past weekend I helped a friend play Tetris w/ some of his games between his basement and storage units. He has amassed quite a *few* games over the years. The ratio I'm leaning more towards conversions compared to dedicated. Anyways, it's kinda fun discovering games' former lives before being conversion fodder. Some notables we found: Juno First; Bagman; Red Alert; Arabian; Vanguard to name a few. Can some of these be converted back? Sure. It's all contingent how well the conversion was done. Sideart painted over? Was it oil or enamel based paint? Was the panel turned into swiss cheese? Bezel stripped? What's nice is there companies reproducing artwork out there - that's "usually the biggest hurdle". So as MAME cabs go... if it's been converted over already; I don't have an issue w/ it. But if it's dedicated - leave it alone and find above example. Don't get all the hate for the Mame emulation fans wanting more of a full experience or wanting to enjoy a real cabinet artwork. I don't either. And while my opinion on the matter of chopping and modding existing cabs is dynamic and ebbs & flows.. I continue to lean more toward do whatever the hell you want! That is correct. Back in the day I got to interview for a technician's job and was appalled and dismayed at what went on in the back room. It was like a torture chamber for electronic games. The things and techniques that were done to force the games to perform was just sickening. Today it doesn't bother me anymore. And in fact if you come across an arcade cabinet, and want to modify it, I'll encourage any conversion to modern electronics with a proper mame install. That's what mame was made for. To preserve the game and replace older electronics. I don't consider playing SF II with an X-Arcade bolted to a Centipede cabinet with a cheesy "MULTICADE!" marquee much of an experience. I agree. Which is why my MAME cabinets aren't fugly. At the end of the day it's not really an "arcade cabinet", it's more of a big fancy desktop PC enclosure with a mounted monitor, etc. ..which is why go for bartops or nice modern set top boxes. And even a NUC for my micro office. Those patents and laws that protect the games don't really exist in the countries where these things are put together (and are LOOONG since not applicable in courts of law regardless due to the time on the patents running out). Copyrights on video game roms are a minimum of 50 years, even in China; and can be much longer. I know, it doesn't matter if people ignore the laws. The Multicades are great. They provide the closest experience you'll get to an original PCB due to re-implementation of the hardware in FPGA form. What I don't like is emulation in those cheap/underpowered boards, the audio quality is atrocious.My biggest issue is with the bootleggers who don't have any rights to distribute the rom images and are using MAME code in their products. I really question their ethics and I would never give them my money. I'm planning on putting some kind of multicade in my basement room, but not one of these crappy 60-in-1 boards. I already have the controls (Happ joystick, Centipede trackball, and 10 happ buttons) and I have a laptop with MAME and roms ready to go. but I'm confused a bit here. IT seems like some of you guys are saying taht using mame code in 60-in-1 is bad because they don't give proper MAME credit (and are selling it). But if I use my own free downloaded copy of mame, am I breaking rules? also - I get the legality of ROMs and such, but isn't the purpose of MAME to preserve, not pirate the roms? Yes copying game roms without permission is illegal. But, as you pointed, just because something is illegal does not necessarily mean it's wrong. I would not feel comfortable paying someone money, no matter how small the amount, when other people's property (and without their permission) is involved. With regards to people commercializing Mame, the current Mame license permits this so there is no issue. At one time the Mame license did not permit the selling of Mame by itself or in another product. And what happened was ethical businesses couldn't use it but unethical ones did. So they updated the license to a normal GPL free license where one of the freedoms is the ability to sell and commercialize Mame. Back to the topic. I like the idea of preserving the old games. The original cabinets are nice but isn't the important thing the electronics. I'd rather see the original electronics in a new cabinet than an emulator in an original cabinet. Yup. Unfortunately it seems totally the opposite. I don't think the electronics are any more important than the cabs. Probably equally as important but that's a matter of opinion really. There are a lot of guys on KLOV who go to great lengths to restore their old or converted cabs. As for keeping old electronics in these games running, it isn't easy. Popular arcade games experienced significant longevity throughout the 80s and some ran into the early 90s. They practically ran 24/7 often exposed to cigarette smoke throughout the years. The situation is a little bit different compared with our Atari 8bits which were made from high quality components. Compare a Namco or Midway Galaga pcb to one from any 8bit Atari model and you'll see what I mean. I don't mind multicade cabinets, but only if a classic cab wasn't scrificed for it. Edited by Jumpman1981, Fri Feb 3, 2017 9:10 AM. I've never seen a classic game converted to a multicade. We have seen them a lot lately, people making multi-cades, where people have machines made with multiple titles in one machine, even original machines have been converted in this manner. 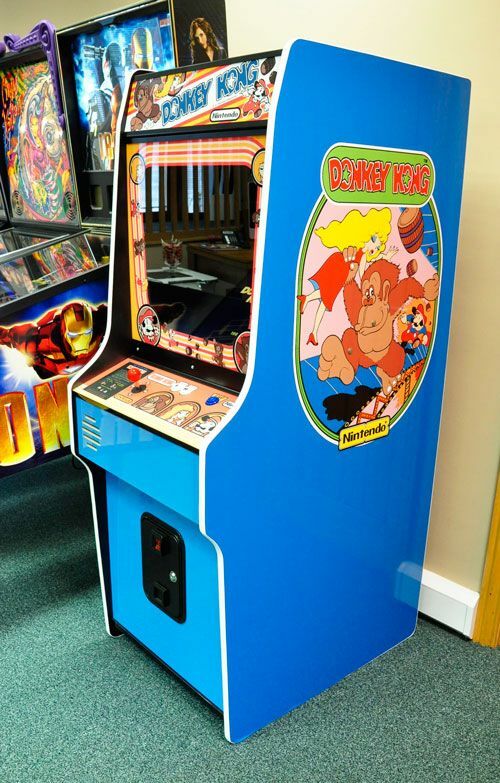 its not uncommon now to find a machine, most likely with the artwork from the original, but with new internals and controls, and a board with many different games on it. My question is, how do you feel about people taking original arcade machines and converting them into multicades? It's better than finding an original machine in horrid disrepair I suppose. One of my area arcades has added Ms Pacman and a few other arcade machines that had been converted to flat screen- And they actually looked good, bright felt new and had interest from kids. Which isn't something you see when see the original machines with dying CRTs are tucked away in the corner. Unless the game cab is in great/pristine condition I wouldn't really care if it got converted into a multicade. That said, I wouldn't do one myself. And the farthest I'd go with a MAME setup is a semi-portable bartop with provisions for removable or plug-in controls as needed per-game. I personally feel the traditional stand-up cabinet is overrated. But that's just me, I respect and enjoy other people's stuff just fine. This is an important and under-appreciated factor. A sleeper factor even! Kids don't like to play on junk. And nothing says junk like a CRT that's collected 30-years of dust, has burn-in marks, and inaccurate color/convergence.. A fresh & crisp LCD fixes that. If a purist wants a CRT, that's fine. And they are welcome to spend the time adjusting and spiffing it up. Not for me. If the machine is broken down and on its last legs, I don't care what happens to it. If the machine is in perfect working condition and was made in the 70s, no. Just no.